Sadhguru: We are at a time of the year which is considered significant for those on the spiritual path. The Tamil month of Margazhi starts from December 16th. At this time of year the planet Earth is closest to the sun. In the northern hemisphere this should have been the hottest month, but it is the coolest because the northern face of the planet is facing away from the sun. The closeness to the sun renders an angle where the sun’s rays are diffused as they hit the planet. They fail to warm the earth as they would have if it were a little away. But in terms of the sun’s gravity functioning on the planet, right now it is at the highest. January 2nd, 2017 is the day when the planet is closest to the sun, so the maximum pull of the sun’s gravity happens at this time. That is the effect the Margazhi month has on the human system – it pulls you from the base. Margazhi is a time to bring balance and stability to the system. There are practices in the yogic system which have been transmitted into the culture in many different ways. This is a time when men will do what generally women are supposed to do, and vice versa. In Tamil Nadu, men will go on nagarasankeertan; they will sing and practice devotion, which are largely considered feminine. Geometry and masculinity are very directly connected. The feminine always pays maximum significance to an object’s color and outer form. The masculine always sees the geometric base first. 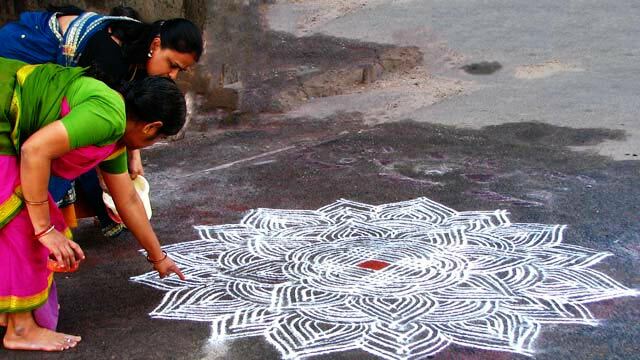 In this month, women practice geometry – not on paper, but in front of their homes, drawing geometrical figures or kolams. Because of a general pull downward, the muladhara (the foundation chakra), and thus the preservative nature of life, become dominant. All life in the northern hemisphere is at its minimum right now. If you plant a seed, the growth will be slowest at this time, and it will not sprout very well. Since the growth is held back by a certain inertia in the life force, this is a time the body can recoup and preserve itself well. Recognizing this, it is still maintained that there are never any marriages in Tamil Nadu during Margazhi. This is not a time for conception. Even grihastas, or householders, practice brahmacharya for this period. This is also a good time particularly for those suffering from psychological imbalances because the sun’s energy is pulling downward, and they can stabilize themselves. In the yogic system, if there is a psychological imbalance, it is always seen as water element going out of control. If you have a tank full of water and shake it, it will slosh. The water element causes various levels of imbalance in a person if the right kind of things are not done with it. Traditionally, in this month, there are various practices to be in touch with water. Generally, people don’t want to miss the brahma muhurtam (3:40am, a conducive time for spiritual sadhana). One of the simplest things people do is go into temple ponds at 3:40am to take a dip. The Margazhi brings a natural sense of stability into the system. There are any number of spiritual seekers who are constantly one step forward, one step backward. This is happening to too many people because there is not enough sadhana towards stabilizing themselves. If you are pulled upward and you are not stable within yourself, it will lead to imbalances. This month is used for stability and the next month, the Thai, is used for mobility. If you have created enough stability within you, only then would you dare to be mobile. This is a time to create balance and stability. This article was originally published on isha.sadhguru.org.